Wow, just...Wow. Whoever designed this hat REALLY likes Pittsburgh. The prizes from winning the Shek Republic Fantasy Football league are STILL pouring in, even though it's April now. 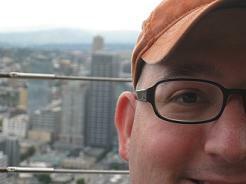 The most recent prizes for winning include this magnificent Pittsburgh hat from Mike Dell (a.k.a. #19) and a collection of Colorado themed sports cards from Josh Semrow (a.k.a. Fourthand26). So thanks to those two gents for their lovely gifts. Seriously, that hat is...something. It's not good, but it is something nonetheless. Truly, Yellow is one of my best colors...plus I was born to rock a tank top! In addition to the prizes, Trace Smith of the Southeast Sports Beat sent me a team jersey from his intramural basketball team which he nicknamed, "The Shek Republic." 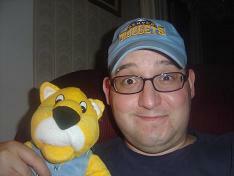 I guess this makes me an honorary captain, and don't I just look stunning in yellow? Anyways, thanks guys! You're the best! Vertically Striped Radio - Episode 48 - The Tim Tebow edition, sigh. A depressed Craig was coming to grips with the fact that the Broncos drafted Tim Tebow. Vertically Striped Radio's official position is that Tebow is a good kid, but not a talented quarterback. Craig was starting to get used to the idea that the Broncos drafted Tebow, but he needed some time to vent about the stupidity of it. In addition to some talk about the NFL draft, we also did a musical rematch of the 2003 National League Championship series matching up Eddie Vedder's pro-Cubs song, "Someday We'll Go All the Way!" with Creed's Scott Stapp singing the goofy Pro-Florida anthem "Marlins will Soar"
We also broke down the Magnificent 7: Seven Greatest TV Theme Songs (With Lyrics), an old show favorite came in at number 1. The Week in Wankery took aim at Domino's Pizza, Comcast, and most importantly Josh McDaniels. All in all a decent show despite my kids interrupting regularly. The Vertically Striped Music Recommendation was the album "The Sun and The Moon" by The Bravery. Yup, he's the King of Denver football, but beware...as heavy is the head that wears the crown when the Broncos are losing. We're a little over a year into the Josh McDaniels era. It is still far too early to make a determination whether or not this is an era or an error, but one thing is certain: The man knows what he wants. 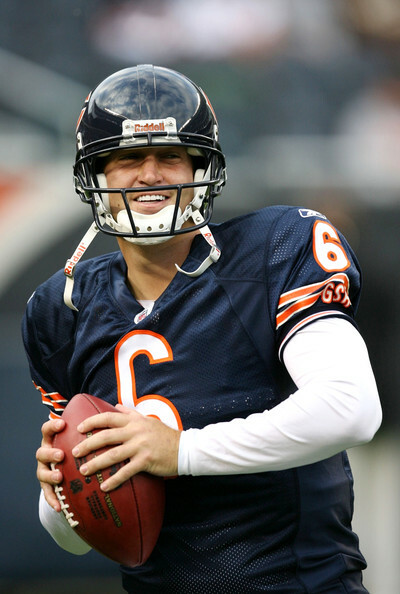 Okay, so his first year in Chicago was less than spectacular, but losing Jay Cutler was hard to take for us here in Denver. What Josh McDaniels wants: His guys playing his way and total secrecy about what playing that way entails. He wants good soldiers, and there are no sacred cows. Seriously, nothing is sacred. It started last off-season; Hey Josh, can I interest you in a good young quarterback entering his prime? "No thanks, I'd rather have someone willing to kowtow to my will. Thanks for the memories, Jay. Hope you enjoy Chicago." This one hurts the most of all. Despite all his problems off the field, few players are as fun to watch as the amazing Brandon Marshall. Can I interest you in a mercurial wide receiver that is a near lock to catch over one hundred balls a season? A guy as likely to make a spectacular play on the field and as he is to cause issues off of it? "No thanks, who needs the drama? Miami is giving me two number 2 picks...have a nice life, Brandon." Thanks for the memories, Tony. Send us a postcard from sunny Detroit! 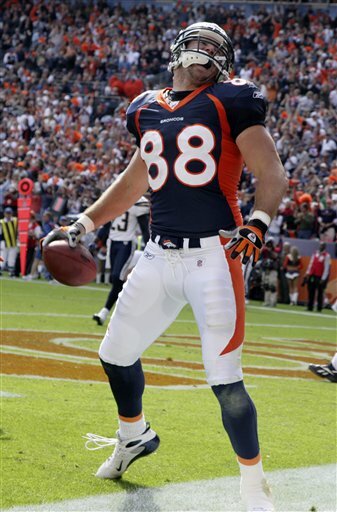 How about a solid young play-making tight end? "Something about that guy rubs me the wrong way, Tony...you're off to Detroit. The Lions are giving me a 5th round pick and a bag of balls!" Josh McDaniels watches over the franchise with same aura of paranoia as the Belichick Patriots. The only problem is that unlike Belichick, he has not earned the benefit of the doubt. 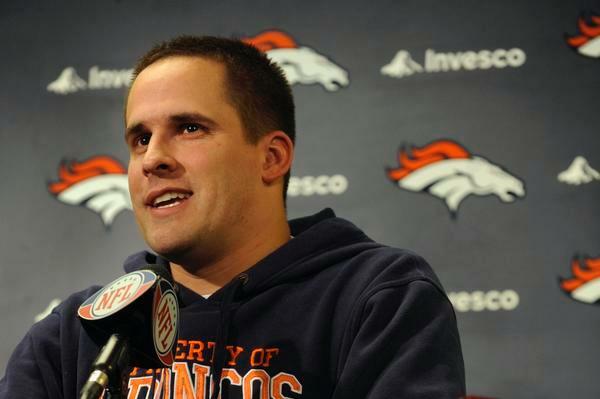 We know the Patriots' coach is good, the jury is still out on the Broncos' young commander. There have been positive moments...Bursting onto the scene with a exuberant fist-pumping 6-0 start had the Mile High City another Mile higher with anticipation. When you have the chance to get a long snapper like Lonie Paxton for only a million a year, you have to JUMP at that! The fact that he has now run Jay Cutler, Brandon Marshall and Tony Scheffler out of town in order to create a talented young offensive nucleus makes sense, until you realize how that actually was a young talented offensive nucleus. Apparently these guys were bad for the team and were a cancer in the locker room, or at least that is the official story. Maybe it's even true. However, the Broncos running game last season was exceptionally pedestrian last season, even though they spent their first round pick on a running back. Now with Brandon Marshall in Miami, the Broncos best wide receiver is either Jabar Gaffney or the Eddie Royal, who was severely under used in the McDaniel's regime last year after a solid rookie year under Shanahan. The Defense started out strong, but faded down the stretch to the point where Mike Nolan was dismissed as defensive coordinator. Now with less talent on the field and on the coaching staff, McDaniels must try to make even more with less as he tries to take less and improve on a middling 8-8 record from 2009. The Broncos are a handful of question marks, and very few answers. Even the quarterback position is unclear as although Kyle Orton has been named the starter for now, the possibility of Brady Quinn trying to compete for the job is now hovering. Josh McDaniels has gotten his way, the players he wanted gone are gone. It's good to be the king. However, the players he now has on the roster are not exactly overly impressive. There are holes all over the field, and the Broncos have gone from a one-dimensional team that was proficient on offense and struggled defensively into a no dimensional team that struggles on both sides of the football. A team that doesn't appear to know what it is or what it's doing, and a team that is trying to pretend that everything is okay. I want to like Josh McDaniels. I was very excited when he lead the Broncos to a 6-0 start and was hopping all over the Invesco Field turf and pumping his fists and slapping five with anyone in the vicinity. However, the combination of his all too frequent spats with his players that he is barely older than along with his penchant to act far too much like his mentor than makes me comfortable, combined with the fact that after his great start, his sputtered like a reconditioned Yugo that is low on gas...well, as much as I want to like him, let's just say I have my doubts. I will say this. You need to prove that you know what you're doing, Josh. And you need to do so quickly. Denver is used to a pretty solid football town. We love our Broncos so much that public pressure forced out a guy who won us two championships because he went a combined .500 for a three year span. You will not be afforded the same benefit of the doubt as Mike Shanahan was. You've made your bed by shipping out three of the most talented Broncos from town and clearly establishing yourself as the head honcho. Time will tell if you were brilliant or not, but you're clearly in charge. You've made your moves, and the Broncos are now clearly created in your image, all I can say is...Josh, You better be right! 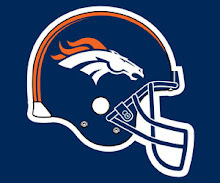 Now, Go Broncos! 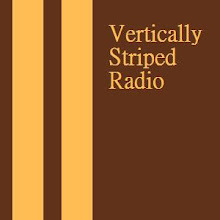 Vertically Striped Radio - Episode 47 - If "Pro" is the opposite of "Con" than what is the opposite of Progress? On the opening weekend of the NHL and NBA playoffs, VSR celebrated by barely talking sports at all. Face Ventura hung around almost the entire show, as he helped promote the World Premiere of Slammed! We closed the show by allowing Face Ventura and #1 Sploser to discuss their Tool Manifesto regarding the Tool song "46 and 2." I gave the reigns of the Vertically Striped Music Recommendation over to my non-cohost, who decided to run with Tool. It was a pretty fun show, today. Sadly, only we had only one winner of 80% trivia, so the very first Vertically Striped Radio autographed pennant is on it's way to New Mexico for Face. 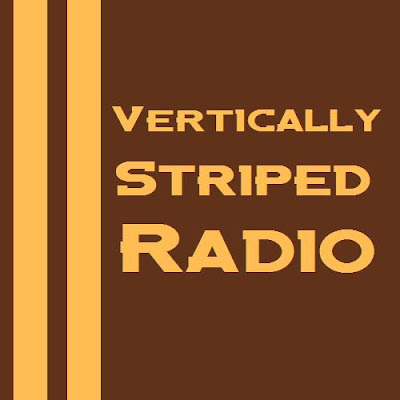 Vertically Striped Radio - Episode 46 - Six different flavors of Klondike Bar. Craig soldiered on despite going to bed too late the night before, having a cold, and helping a buddy move for two hours right before the show. It helped that Face Ventura was around for most of the show picking up slack. The show was a little uneven this week, although we had a good episode of "The Week in Wankery" and we had our first visit ever from Josh Semrow, aka Fourthand26, from the Dameshek.com messageboard, Josh was making his DAMN debut, and let us know a little about his life of playing 4 square and buying Pokemon games. The Ed called in after waking up from a nap and shared a bit of wisdom along with breaking down the stats from his fantasy baseball league this week. Apparently he is doing okay in WHIP...whatever that means. Ed also let us know that there are six different flavors of Klondike Bar, although he didn't tell us what he would do for a Klondike bar. He also sang a song about a town in Arizona for some reason. We also had a brief cameo from Major Minority. The music recommendation was the song "Sovay" from Andrew Bird from the album "Weather Systems." It's a little mellow, but not too shabby. 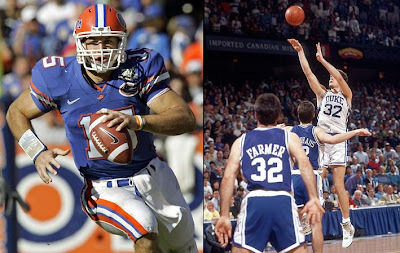 The Frightening Similarities Between Duke Basketball and Tim Tebow. I like Tebow and strongly dislike Duke, but is there a legit comparison between the two? I'm not a huge college basketball fan. Pretty much, I consider myself a fan of the sport from the start of conference championship week until the Championship game on the first Monday night in April. Six weeks of interest at max. Of course, by the time the Championship game comes around, I'm all into it, and I tell myself that I should start to follow it earlier next year...only November rolls around and I once again treat regular season college basketball like a mix of Bubonic plague and the WNBA. I just can't make myself like it until late February, and I've come to grips with that fact. Somehow I managed to spell "Krzyzewski" correctly without looking. I don't know how I got that lucky. 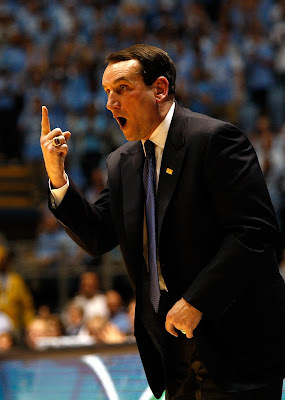 Despite my rather shallow fanship of the sport, I have followed it long enough to develop a distaste for Duke. Something about them rubs me the wrong way. 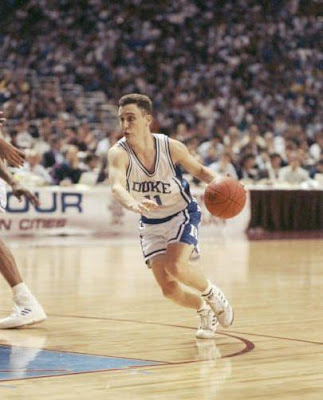 I don't know if it's because I couldn't spell Coach K's last name if my life depended on it...In fact, here is my best shot prior to looking at Google. (Krzyzewski) Holy crap, I swear to the god of all things holy that I didn't look that up, and somehow I got Krzyzewski spelled right! What are the odds? I should go buy a lottery ticket or something. How badly would USA Basketball like to go back in Doc Brown's DeLorean and right this wrong? I dislike the way they pound the floor to show their defensive intensity. I dislike their preppiness. I disliked Bobby Hurley, and I can't believe that Mr. and Mrs. Parks thought it was a good idea to name their son Cherokee. 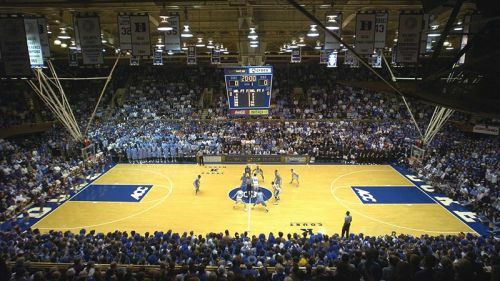 I hate those tools that call themselves the Cameron Crazies and hop up and down all game in Cameron Indoor Stadium, and I hate that they call their stadium Cameron Indoor Stadium. Seriously? It's basketball, is saying "Indoor" really necessary at this point? Are there outdoor NCAA basketball games popping up everywhere that I am unaware of? Cameron Indoor...so as not to be confused with an outdoor stadium. I can't be the only guy to find Bobby Hurley annoying. I was really bummed this evening when the desperation half-court heave for Butler rimmed in and out because really, if that had gone down, not only would Duke NOT have won, but it would have been the best game in NCAA history, or at least on a very short list. Alas, some things were not meant to be. This evening I settled into the new reality that I now live in a world where the Yankees, Lakers, and Blue Devils are all at the top of the mountain simultaneously, and seriously, how depressing is that? I began to think about why I dislike the Dukies so much, really why are they generally regarded as the least likable school in college basketball? Here is where my thoughts led me, and I'm not sure I liked it. Crazy good, and a tremendous guy, and yet he is widely disliked across the country? 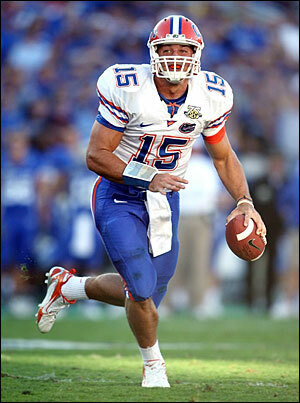 We dislike Duke because they are Tim Tebow. They are intense, more talented than anyone wants to give them credit for, they have zero street cred, they play a brand of ball that is something that people say they want but dislike when they get, and they are both super ultra-white. Duke has a higher preppy factor, and Tim Tebow is much more devoutly religious, but apart from those factors, the similarities are striking. There are a lot of Duke fans, just as Tim Tebow has a lot of supporters, so I'm not trying to say that both are universally hated, but if you check the temperature in a room full of neutral sports fans, I believe you will find significantly more Duke haters than supporters, and a lot more people who dislike Tebow than like him. 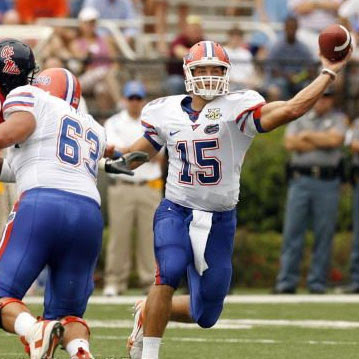 Love him or hate him, you can't deny that Tim Tebow's college career is glorious. A lot of that is the hater factor. Tim Tebow just completed quite a career at Florida. Despite the fact that his game looks unlikely to translate well to the NFL, he's still accomplished an awful lot. In addition to his on the field success, he carries himself with a moral code that simply mystifies many sports fans. Sports fans are a crude lot at times, and the idea that a guy could be so dedicated to his belief system that he would be able to be the most popular guy on a college championship football team and also remain a virgin is like explaining to them that Martians are marching on Washington to demand equal rights for homosexuals. It's not only weird but it is monstrously difficult for the average sports fan to comprehend how it could happen. 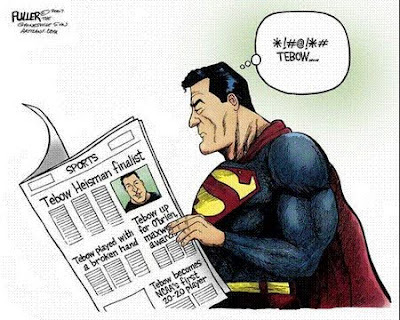 Tebow finds himself disliked by many due to the fact that he is crazy successful, crazy talented, and in the minds of many he is certifiably crazy or worse. To those skeptical of his claims...he comes across as hypocritical. Many think that his hyper-competitiveness on the field, and his hyper-religiousity off it are a house of cards. He's too good to be true, so that means that he isn't true, and they hate him. He's too white, too good despite appearing to be an aw shucks hick, and there is just something about him. 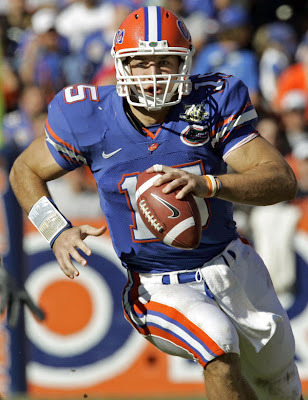 Compare those reasons many harbor for hating Tebow with the reasons that leave so many including myself with a bad taste in their mouths for Duke. Duke is very intense, Coach K seems too good to be true, like some of his image may be an act, many people crush Duke for being too white. They seem too good to be true, yet they don't seem talented enough to be able to pull off so many championships. There is just something about Duke. In theory, we should like both Duke and Tebow. (For the record, I'm actually a fan of Tim Tebow.) Duke is a clean program and Tim Tebow by all accounts lives one of the cleanest lives in the history of Division One football. Both play the game the right way, by giving their all and rallying people to their side with intensity and fair play, and both Duke and Tebow have found tremendous success, which usually brings throngs of adorers. However, so many of us find that there is something off putting about each of them. 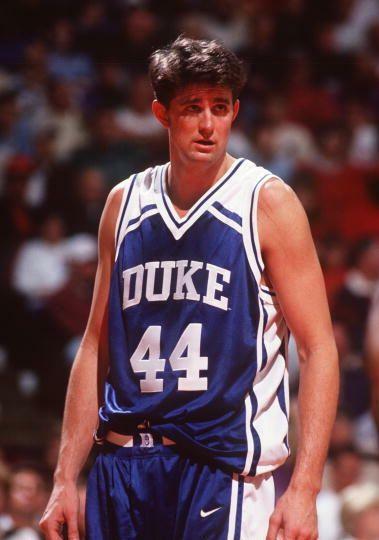 Maybe if the NFL doesn't work out, Tim can transfer to Duke to hoop it up for a few years for Coach K? I can't explain it, but it is interesting. Ask your average middle aged white guy the things they would like to see from a quarterback or a basketball program, and they'll almost certainly describe a player like Tim Tebow or a school like Duke. Then show them Duke or Tebow, and watch them turn their heads in disgust. I don't get it, but I do find it interesting. Oh, and I'm still sad that Butler fell just short. 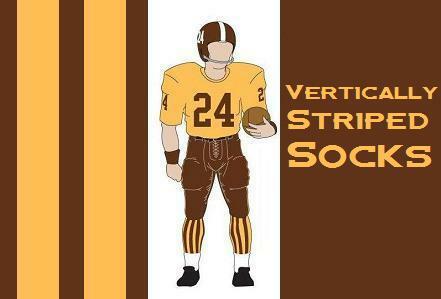 Vertically Striped Radio - Episode 45 - Finally, The People You're Allowed To Make Fun Of! Final Four weekend, and we had to get our favorite prognosticator's picks for the NCAA Championship. For the record, Luke took Michigan State to beat West Virginia in the Final. Face Ventura and The Whale helped me FINALLY break out the "People it is okay to make fun of" segment. The Ed called in right at the end of the segment, and he was on his game. We discussed his April Fools joke on the Dameshek.com message board, the NCAA tourney, Cinchcast.com, and other assorted topics including the Ed's take on bigomy. The Ed was in fine form, to be sure. He even shared some of his favorite recipes including Chocolate and String Cheese. The Ed is clearly a culinary expert. The show ended with a Vertically Striped Music Recommendation with a story. The song was Frank, AB from the album "Hometowns" by Rural Alberta Advantage, so I told a little bit about the story of the Frank Slide...one of the largest Landslides in the history of North America...which is also the event on which the song is based.